On amd-utils I added a pretest script that checks if all modules have specs (if it can’t find it will create a failing spec for the module) and update all packages/spec runner. I also added a script to check the code coverage of my tests (using Istanbul) to make sure pull requests (and my own commits) have a high code coverage. - "node ./node_modules/.bin/istanbul check-coverage --statements 90 --branches 90 --lines 90 --functions 90"
With the code above the integration test will fail if the code coverage is below 90%. This will ensure we have tests for every method and will help check if our tests are covering different scenarios - code coverage is just a metric to help you identify potential problems, it doesn’t really mean your tests are good enough, it just identify if the statement/line/function/branch was executed at least once, so beware, don’t trust it blindly. - I’m not setting the code coverage higher since amd-utils have some specific code branches that are only executed on old JS engines (specially IE). Check the last build report. 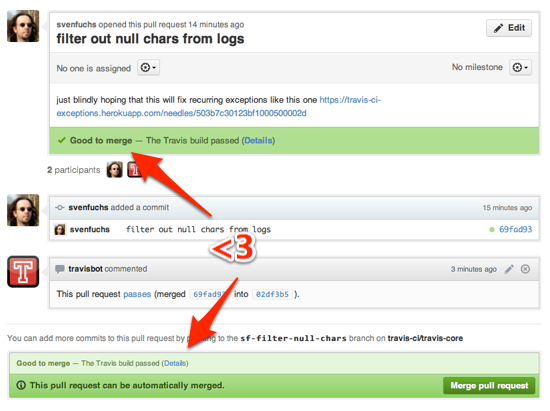 Travis is nicely integrated with Github, showing if a pull request passes the CI test, it is a good way to spot errors early. The build status icon is also a nice indicator to add to the project README.md file. I highly recommend it for projects with multiple contributors, will be using it on all open source projects from now on. Automate repetitive tasks and make contribution easier, it will surely pay off in the long run.